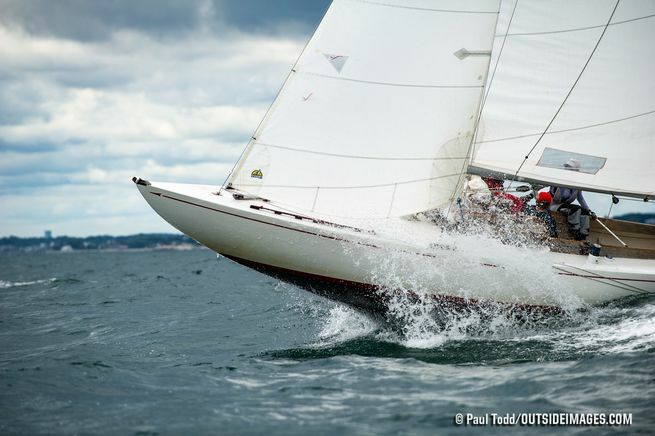 The 129th Marblehead Race Week launched Thursday as two of 10 classes competing in the Helly Hansen National Offshore One Design (NOOD) Regatta this weekend took to the water. With light winds and challenging water conditions, the Rhodes 19 and International One Design (IOD) fleets had their work cut out for them. Despite the swell, chop and current, the fleets were able to complete two races to kick off the regatta. In typical fashion, competition was tight in the 24-boat Rhodes 19 class, a Helly Hansen Marblehead NOOD staple. Local skipper Larry Ehrhardt narrowly holds the lead with one third- and one first-place finish. Ehrhardt is sailing with his 14-year-old son, Allen, and said that the “family experience” makes this regatta extra-special. The father-son duo dropped to third place after an early lead in the first race but made it up with a grand comeback in the second. Only one point behind team Rallie is Stoughton, Mass.-native David Nelson on Tough Cookie, who won the first race, followed by William Heffernan of Dover, Mass., in third. According to Ehrhardt, the key to holding the lead is to continue being cautious in the early days of the regatta. “The game plan with a regatta like this is to not lose it in the first couple days, so we’re trying to sail as conservatively as possible, trying to maximize opportunities when we’ve got them but not taking any huge risks,” he said. Leading the small-but-mighty IOD fleet is Bill Widnall, of Lexington, Mass., and his team aboard Javelin, who won both of the day one races. Local Marblehead boats Gypsy and Tango round out the top three, respectively. 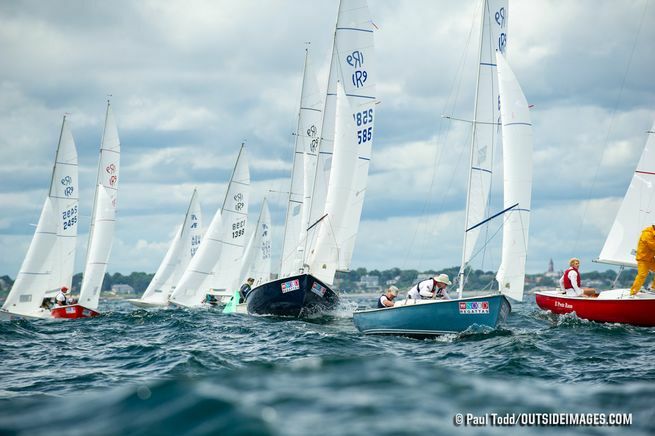 Elsewhere on the bay, the J/70 fleet took advantage of the opportunity to test the playing field in advance of the Helly Hansen NOOD Regatta and, subsequently, the class championship in Marblehead this September. The fleet held a clinic on Thursday, completing two unofficial practice races with the help of professional coaches. 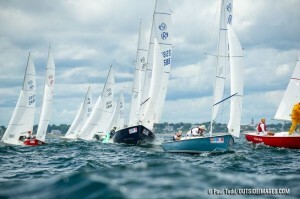 As of Thursday afternoon, 188 boats are registered in the Helly Hansen NOOD Regatta at Marblehead Race Week. Six of the remaining eight fleets will join the Rhodes 19s and IODs on Friday, followed by the final two (Lasers and Laser Radials) on Saturday.